I'm not a Peter David fan. Oh, I've read a few of his books, but I consider him to be a workmanlike author rather than an artist. Of course, I also consider him to be a newcomer, since I respect very few post-1980 authors (exactly three, in fact: Brust, Brin, and Watt-Evans).But In the Beginning is surprisingly well-written. It was shot in the dark for me, quite literally; I don't remember where I'd originally picked it up, but I'm sure I didn't buy it new (the pencil marking inside says $2.95). It was late at night, I desperately needed something to read, and I'd just turned off the light in the den; it was pitch-black. 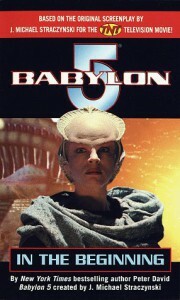 So for a lark, I pushed aside the books in the outer layer of one of my bookshelves (I'm terribly short of shelf space), and pulled out a book at random from the row of books behind.Now, I must admit up front that I was a big fan of Babylon 5. In fact, it was the last show that I would call myself a "fan" of; I think I got too old for the fan phenomenon after that. But from seasons 1-4 I was a big fan, and even wrote a one-shot zine for a Babylon 5 APA (amateur press association, a collection of zines on a topic). 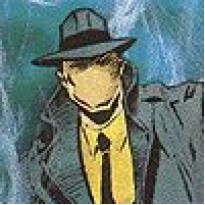 *Anyway, I have to say that Peter David captured the voice of the narrator, Londo Mollari, extremely well. I could hear the voice just as Peter Jurasik performed it while I was reading it. I don't know if someone who isn't familiar with the show itself would get the same enjoyment out of the book, therefore.In any case, I'd call it a successful novelization; it captured the plot and essence of the broadcast show extremely well. There was only one jarring note. On page 75, there's a line:Indeed, the gravity on the Babylon 5 space station was achieved entirely through a steady rotation, the same as that on any planet.Perhaps Peter David only meant to say that planets have a steady rotation, but it certainly seems as if he's saying that centrifugal (or is it centripetal?) force is the source of gravitation on planets - and of course, that's absolutely wrong! If planetary gravity was caused by rotation, everything not fastened to the planetary crust would be flung into space. Could a modern science fiction author really be that ignorant of basic physics? I have to wonder!All in all, though, an enjoyable read. I was tempted to give it four stars. But if you're not a B5 fan, you're probably more likely to consider it a 3-star work.----------* - I'm not sure if this link will work, but if it does here's a link to that zine: http://www.maranci.net/babble-on5.pdf . It has been annotated from a years-later perspective.